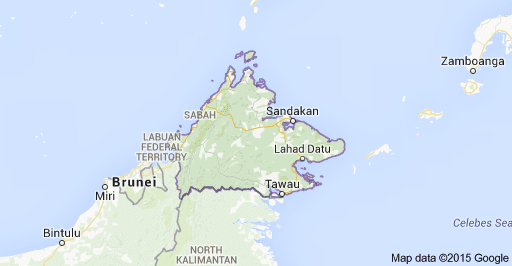 Sabah is Malaysia's easternmost state, one of two Malaysian states on the island of Borneo. It is also one of the founding members of the Malaysian federation alongside the Crown Colony of Sarawak(Sarawak), Singapore (expelled in 1965) and the Federation of Malaya (Peninsula Malaysia or West Malaysia). Like Sarawak, this territory has an autonomous law especially in immigration which differentiate it from the rest of the Malaysian Peninsula states. It is located on the northern portion of the island of Borneo and known as the second largest state in the country after Sarawak, which it borders on its southwest. It shares a maritime border with theFederal Territory of Labuan on the west and with the Philippines to the north and northeast. While a land border is also shared with the province of North Kalimantan of Indonesia in the south. The capital of Sabah is Kota Kinabalu, formerly known as Jesselton. Sabah is often referred to as the "Land Below The Wind", a phrase used by seafarers in the past to describe lands south of the typhoon belt.